In the garden I did no crime. 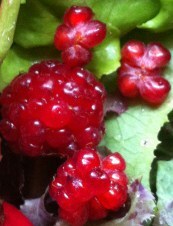 The raspberry bush has been sputtering out berries this summer and I’ve been racing the birds to get them. It’s our relatively peaceful version of The Hunger Games. Victori spolia. My garden raspberries are different from the ones I buy at the store. They are sun-warmed, sweeter, and burstier. Each of their drupelets is an explosion of sunlight, frogsong, and butterfly wings on the tongue. They have virtually no shelf life. Frogsongs fade fast when plucked from the earth; you must eat them while their echos still vibrate to taste the music. Berries in general are highly perishable. There’s a significant loss of vitamin C and polyphenol antioxidants within just a couple days of harvest. So I’ve been inventing ways to infuse my cells with berry goodness as often as possible. Here are just a few of my favorite berry treats. While they need no accompaniment, sometimes it’s fun to let them frolic with friends. It’s really fun to sing along with Tori Amos’ Raspberry Swirl as I spin them around in a blender. I toss in strawberries, a squeeze of lemon, a squirt of lime, and a splash of cranberry juice and grape juice. 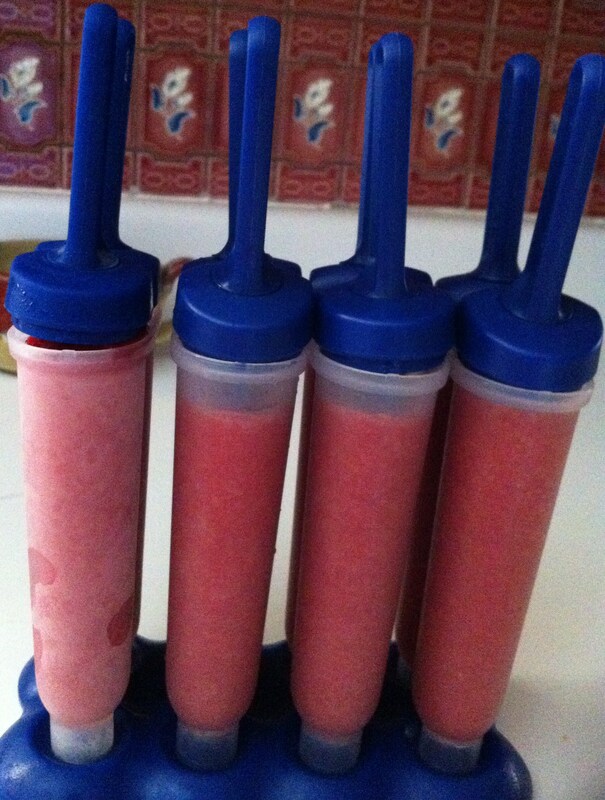 This concotion makes yummy popsicles. I call them Raspberry Zingers. Sometimes I throw in a little peach to a get different texture. After filling the popsicle molds, I add a dallop of yogurt and a dash of milk to whatever is left in the blender to make a smoothie. Fun fact: The phytonutrients in raspberries and strawberries have anti-inflammatory properties when consumed regularly (about three times a week). 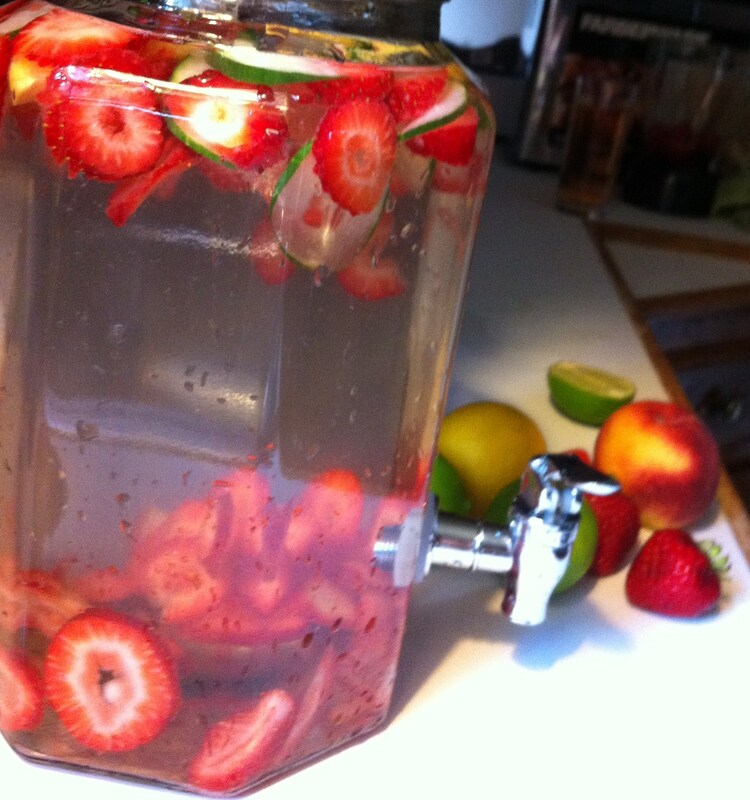 The idea is to send sliced fruit floating in water for hours to infuse the water with flavor. I’ve been experimenting with variations, but so far my favorite is sliced up strawberries, squished raspberries, cucumber, a little squirt of lime (or sometimes lime slices), and fresh mint. This week the pineapple basil is making a spectacular comeback after the rain we’ve had, so I added a few leaves. It’s tasty! Fun fact: Raspberries are rich in vitamin C, fiber, and vitamin K. They also contain folate, vitamin E, and potassium. Here’s what was on last week’s menu. You can following the links (in bold) for recipes. Breakfast: Vanilla yogurt on toffee granola topped with fresh raspberries, and tea. As far as nutrition, we’ve got calcium, fiber, iron and B-12. The raspberries add a little extra fiber, vitamin C and a whole lot of yum. Lunch: Arugula salad (picked fresh!) with oil and vinegar dressing, flatbread, and an orange. Dinner: Ok, I admit this is an odd combination — corn chips and guacamole and a side of grilled asparagus. Breakfast: Vanilla yogurt on toffee granola topped with fresh raspberries, and tea. Lunch: Annie’s Shells & Cheese with fresh steamed broccoli. Dinner: a 3-ounce fillet of salmon, sauteed squash, and 1/2 an avocado. Yes, I ate fish. This was the main source of my B-12 this week. Lunch: Vanilla yogurt on toffee granola topped with fresh raspberries. Again! It’s that good. Dinner: Eggplant parmesean and a salad. Breakfast: Leftover chocolate cake and tea. Lunch: Homemade yeast roll drenched in butter and honey. I know — sugar, sugar, sugar! Dinner: Blackbean tortillas, salsa, cheese dip and salad. Lunch: El-D’s amazing vegetable soup with yeast rolls. Dinner: Sharky’s for El-D’s birthday. I had fried oysters, a bit of fried fish, and edamame and corn succotash. Breakfast: Vanilla yogurt on toffee granola topped with fresh raspberries. 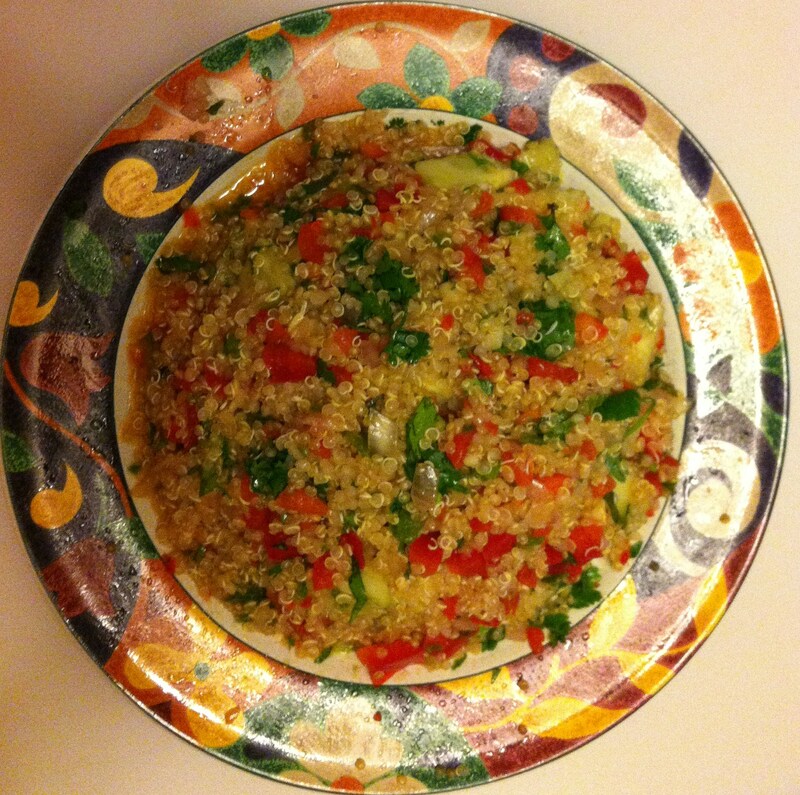 Lunch: Quinoa and avocado salad. Dinner: El-D’s amazing vegetable soup. Breakfast: Yeast roll with butter and honey. Lunch: Bombay House vegetarian lunch buffet. I treated myself to my comfort food. Dinner: Mushroom stroganoff and roasted cauliflower. Lunch: Popcorn sprinkled with nutritional yeast. First a disclaimer: I am not a dietician! Please consult with someone more knowledgable if you want medical advice about your diet. 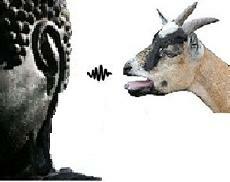 I am merely a carnivore turned (mostly) vegetarian, trying to find my way in a meat-eater’s world. I say I am “mostly” vegetarian because I have added the occasional dash of seafood (usually one meal a week) to my diet to get vitamins B-12 and D. For example, just a few ounces of shellfish (e.g., oysters) are loaded with B-12. There are other ways to get these vitamins, but my personal preference in avoiding malnutrition does not involve chugging milk by the gallon nor ingesting tablets made in a lab or factory. So this week I’m posting what’s been on this vegetarian’s menu. If folks want recipes, maybe El-D will provide them, ’cause he’s the chef around here. Friday Breakfast: I skipped it. Bad me. Friday Lunch: Veggie plate at the Silver Caboose, which included cream corn, okra and tomatoes, and sweet potato casserole. Saturday Breakfast: Waffle with maple syrup and a banana smoothie. I know he uses Bob’s Old Mill Waffle mix, Flax seed meal, and EnerG Egg replacer (in place of eggs) for the waffles. Oh, and rum — El-D recently informed me he also puts homemade vanilla rum in those waffles. Who knew? The banana smooth is easy – he just tosses about 5 frozen bananas in the blender with about a cup of almond milk. 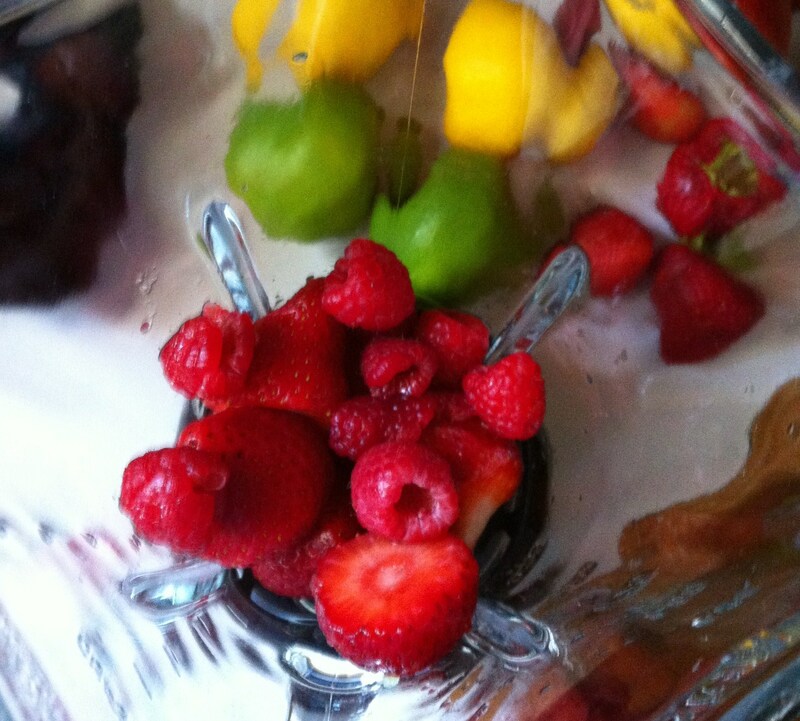 He garnishes the smoothie with nutmeg and honey. Saturday Lunch: Bombay House — This is my absolute favorite Indian restaurant in Memphis. They know how to make hearty vegetarian fare. I call it my “comfort food.” I feasted on the buffet, which included Aleo Tiki (I call ’em potato fritters), Mushroom Bhaji, Sag Paneer (a creamy spinach), Aloo Bangan (eggplant), Naan (flat pancake-like bread), and Desert Burfi, Rice Pudding, and Chai. Saturday Dinner: I ate so much for lunch that I didn’t need dinner. I may have eaten some popcorn as a snack. I don’t remember. Sunday Breakfast: Amish Friendship rolls smothered with butter and cranberry-strawberry preserves with tea. Sunday Lunch/Dinner: El-D’s amazing homemade carmelized onion pizza. Monday Breakfast: Amish Friendship rolls smothered with butter and cranberry-strawberry preserves with tea. Monday Lunch: El-D’s leftover amazing homemade carmelized onion pizza with grape juice. Monday Dinner: Amish Friendship rolls smothered with butter and cranberry-strawberry preserves. Tuesday Breakfast: Amish Friendship rolls smothered with butter and cranberry-strawberry preserves with tea. Tuesday Lunch: Two plums and two flatbread crackers with tea. Tuesday Dinner: Blackbean and avocado dip wraps. So that’s the last five days of my food life. I’ve probably consumed enough sugar to kill a hummingbird. I’m not sure if this qualifies as “healthy” but it’s been really, really tastey! God made food; the devil cooks. The Devil insists his Sin-a-Buns are easy and quick to make. One must wonder why then he started them in the morning and then made me wait ALL DAY (until dinner!) until they were “ready” to eat. The answer to that mystery is this: because he’s The Devil. Place all dough ingredients into a bread machine set to ‘dough’ setting. The Devil’s bread machine takes about 1.5 hours to complete. Make sure all ingredients are mixed well and you have a smooth, lightly elastic dough. Remove dough from bread machine and place on a lightly floured surface. 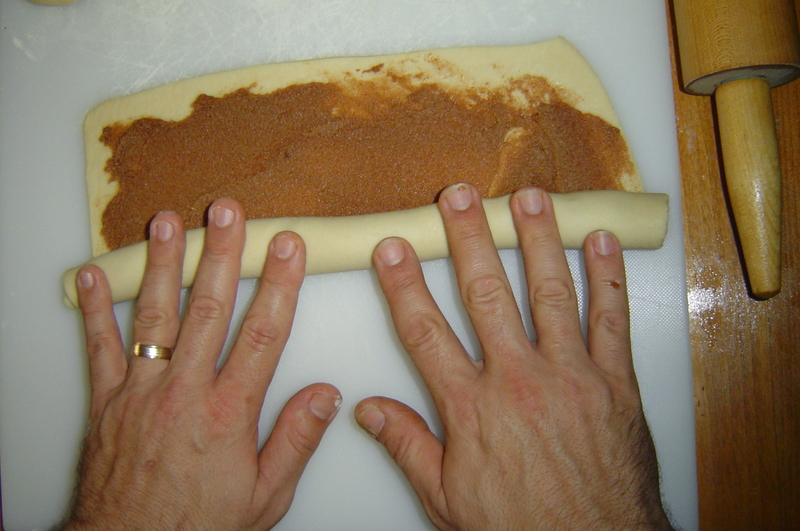 Separate dough into four equal pieces and roll each piece by hand to form a long baguette. Let rest for a few minutes, then roll out each piece, one at a time, to form a thin layer of dough in the shape of a rectangle. Mix all filling ingredients until a grainy paste is achieved. Divide the filling into four parts, and use a flat spatula to spread 1/4 of the filling evenly on each piece of rolled-out dough. 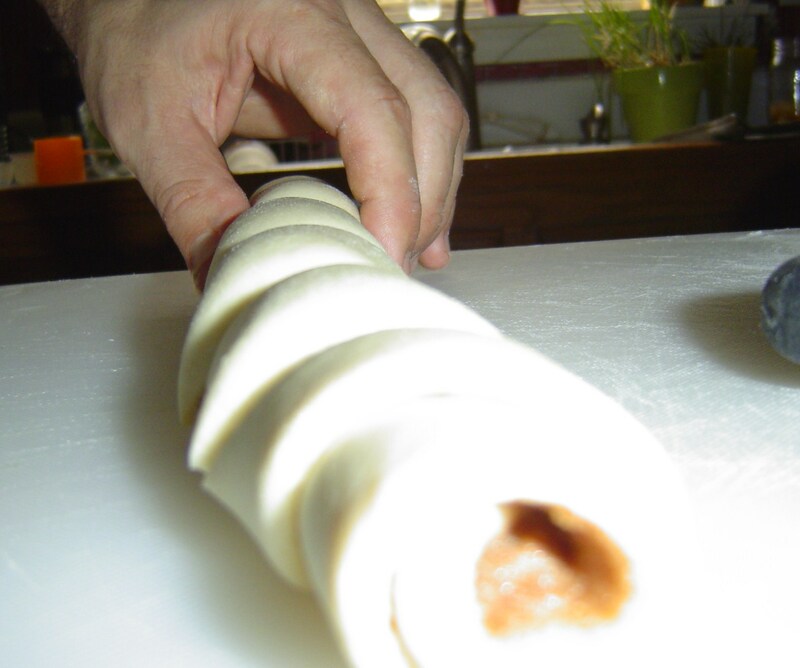 Roll up the dough longways and take a sharp knife to slice the roll into 6 rolls. You should end up with 6+6+6 [+6] rolls. Place the rolls into a greased 9″ x 13″ glass baking dish and bake in a 375 F oven for 25-30 minutes, or until light brown on top. 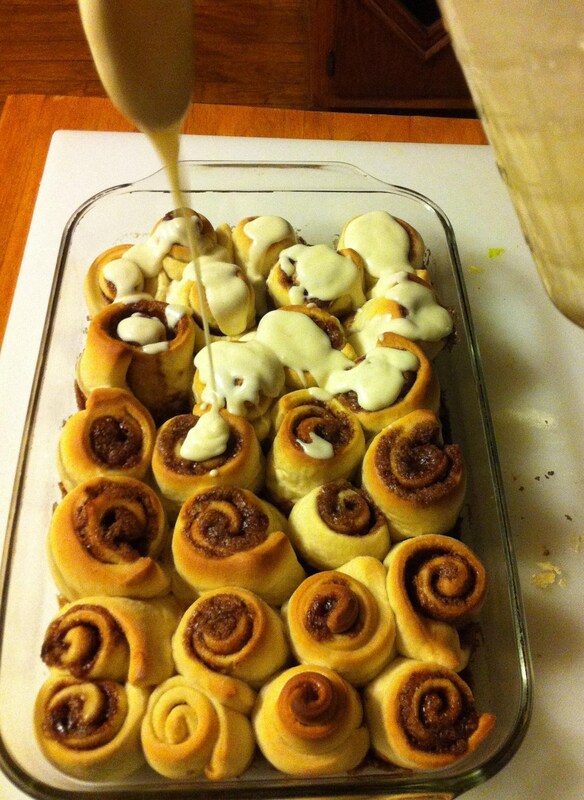 Heat icing ingredients in microwave for 30 secs.- 1 minute, then stir and drizzle on top of the rolls as they cool. Then enjoy the sinful, gooey goodness. They are nothing short of amazing.